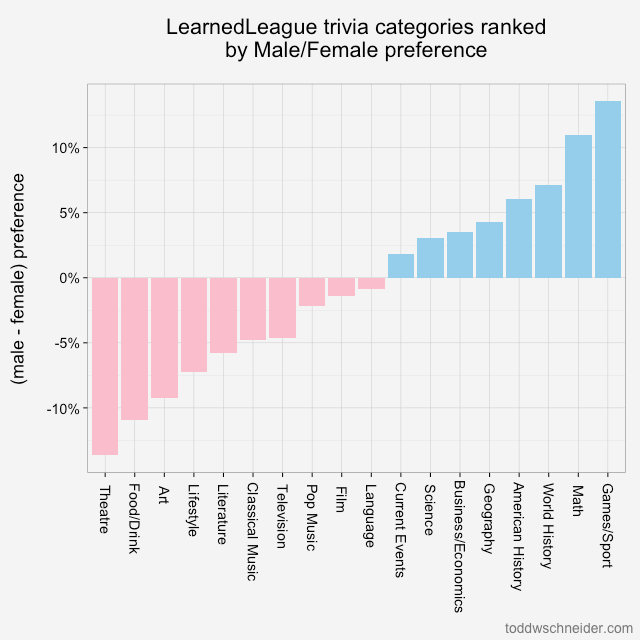 LearnedLeague bills itself as “the greatest web-based trivia league in all of civilized earth.” Having been fortunate enough to partake in the past 3 seasons, I’m inclined to agree. It stands to reason that performance in some of these categories should be correlated. 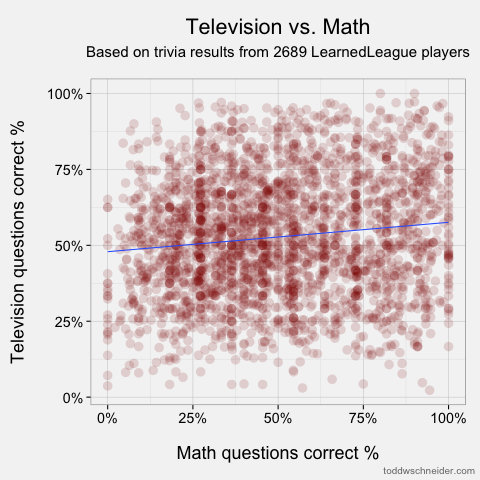 For example, people who are good at TV trivia are probably likely to be better than average at movie trivia, so we’d expect a positive correlation between performance in the TV and film categories. It’s harder to guess at what categories might be negatively correlated. Maybe some of the more scholarly pursuits, like art and literature, would be negatively correlated with some of the more, er, plebeian categories like popular music and food/drink? With the LearnedLeague Commissioner’s approval, I collected aggregate category stats for all recently active LLamas so that I could investigate correlations between category performance and look for other interesting trends. My dataset and code are all available on GitHub, though profile names have been anonymized. I analyzed a total of 2,689 players, representing active LLamas who have answered at least 400 total questions. Each player has 19 associated numbers: a correct rate for each of the 18 categories, plus an overall correct rate. For each of the 153 pairs of categories, I calculated the correlation coefficient between player performance in those categories. The full list of 153 correlations is available in this Google spreadsheet. 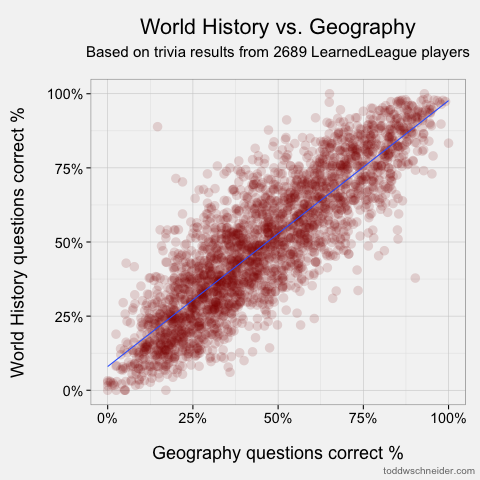 At first I was a bit surprised to see that every category pair showed a positive correlation, but upon further reflection it shouldn’t be that surprising: some people are just better at trivia, and they’ll tend to do well in all categories (none other than Ken Jennings himself is an active LLama!). The most correlated pairs make some intuitive sense, though we should always be wary of hindsight bias. Still, it’s pretty easy to tell believable stories about the highest correlations: people who know a lot about world history probably know where places are (i.e. 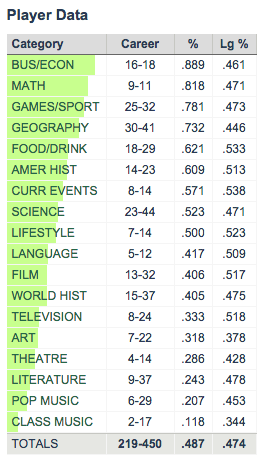 geography), people who watch TV also watch movies, and so on. I must say, though, that the low correlation between knowledge of math and the pop culture categories of TV, theatre, pop music, and film doesn’t do much to dispel mathematicians’ reclusive images! 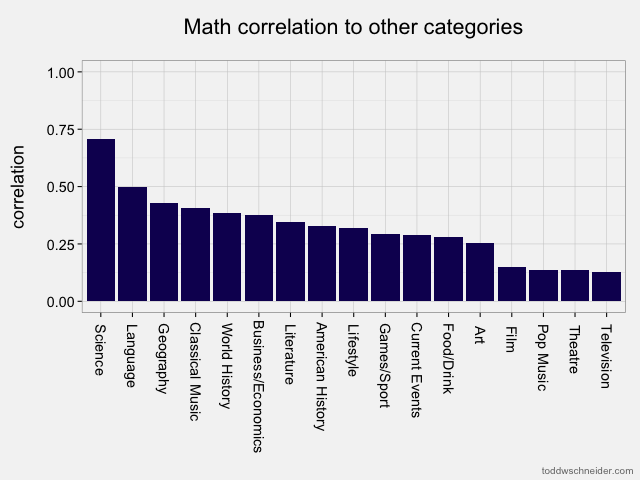 The only category that math shows an above-average correlation to is science, so perhaps it’s true that mathematicians just live off in their own world? The decision tree uses only 4 of the 18 categories available to it: games/sport, theatre, math, and food/drink, suggesting that these are the most important categories for predicting gender. Better performance in games/sport and math makes a player more likely to be male, while better performance in theatre and food/drink makes a player more likely to be female. How accurate is the decision tree model? The dataset includes 2,093 males and 595 females, and the model correctly categorizes gender for 2,060 of them, giving an overall accuracy rate of 77%. Note that there are more males in the dataset than there are correct predictions from the model, so in fact the ultra-naive model of “always guess male” would actually achieve a higher overall accuracy rate than the decision tree. However, as noted in this review of decision trees, “such a model would be literally accurate but practically worthless.” In order to avoid this pitfall, I manually assigned prior probabilities of 50% each to male and female. This ensures that the decision tree makes an equal effort to predict male and female genders, rather than spending most of its effort getting all of the males correct, which would maximize the number of total correct predictions. 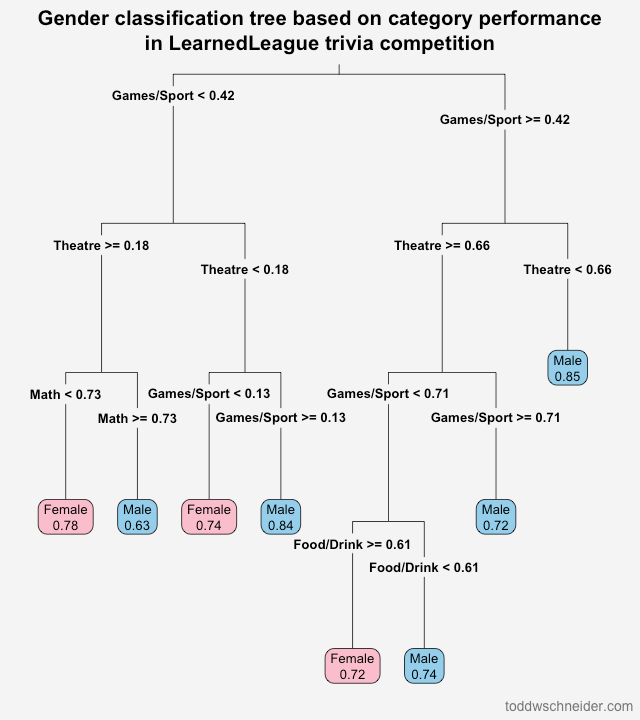 Similar to the results from the decision tree, this methodology shows that theatre and food/drink are most indicative of female players, while games/sport and math are most associated with male players. The dataset and scripts I used for this post are available on GitHub. 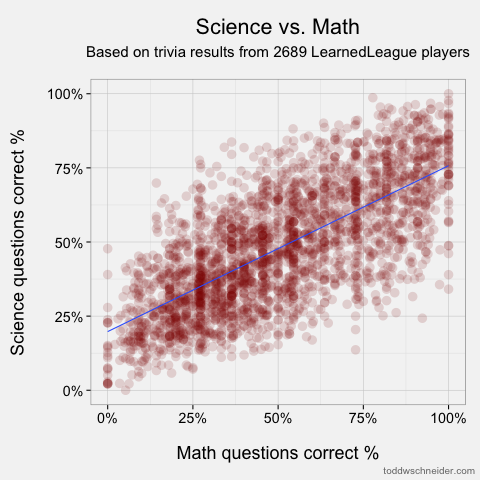 If you’re interested in LearnedLeague, this article provides a good overview, and you can always try your hand at a random selection of sample questions.